A vast expanse of blue, green and pink or­ganic shapes unfolds on the canvass. The leaves, rhizomes and trees weave together a complex space. On top of the biologic forms is a abstract, geometrical rectangle of black and red, adding visual contrast to the piece. It’s hard to stop looking at the image. This is one work from the Charles Geiger exhibition, Quasibotanics: From Apocalypse to Now, currently on view at Vassar’s Palmer Gallery. The paintings will be on display until Nov. 30. There will be an opening reception on Thursday, Nov. 5 at 5 p.m. According to Geiger, he seeks to explore and utilize the symbolic significance of these vege­tation structures. “I am interested in the sym­bolic energy of a newly sprouting green leaf, and the unique interconnectivity of rhizomes and rhizome systems. The continuous process of breaking and recovering of rhizomes are of interest to me. So for my practice, leaves and rhizomes are a set of botanically derived lin­guistic symbols, and with them I do paintings about environmental and health issues,” ex­plained Geiger. Over time, Geiger has internalized this or­ganic, visual language. “The botanical grammar set became a part of my ritual of painting that I call “Quasibotanics,” he said. In addition to nature, Geiger takes inspi­ration from other artists. With their pastoral landscapes and serene atmospheres, the Hud­son Valley School paintings allowed Geiger to look at the world in a new light. Based on this new vision, he then developed a contemporary use of the subject matter. It was a mutual effort by both Geiger and Vassar to put together the exhibition. Associate Director of the Palmer Gallery, Monica Church, visited the artist’s studio and discussed work se­lection with Geiger. 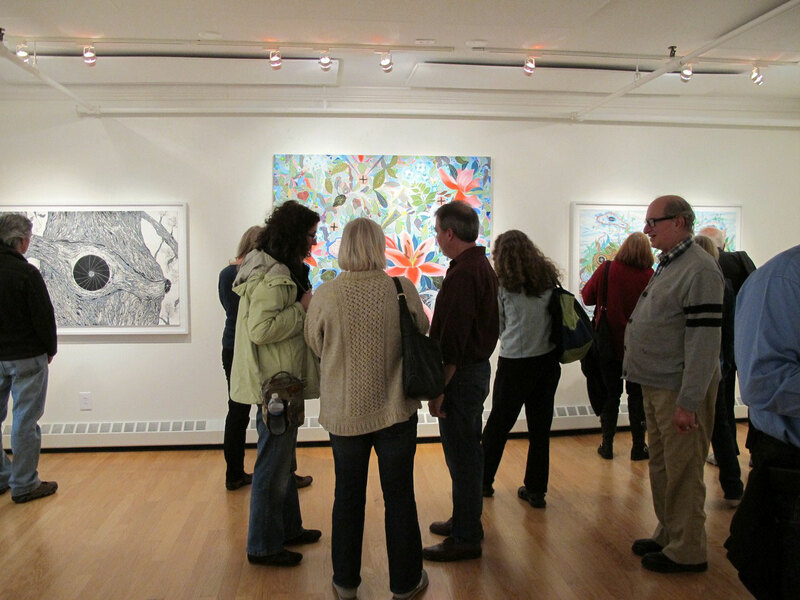 “This show was organized by Palmer Gallery Director Teresa Quinn. She and I made a studio visit to discuss what body of work Charles would exhibit. Given the physical properties of the gallery, we opted for an exhibi­tion of most recent paintings rather than a retro­spective,” she recounted. Working with Geiger’s paintings closely, Church expressed the particular styles that in­terested her. “I respect his work and am espe­cially fond of the more open paintings on paper that use transparent ink washes and iridescent paints,” said she. Jose Erazo ’16 is one of the gallery guards who sits at the front desk of the Palmer, and possibly who spend the most time with the works. Erazo is very excited about the life and spirits embod­ied in the multitudes of colors. “The works are absolutely beautiful. This might be my favorite exhibit here this year. They are all so colorful and very complex. I love the vibrant colors and the focus on nature. I don’t think I have ever seen so much color in this gallery and I have been working here for two years now,” he said. With all these colors, organic shapes and con­ceptual considerations, Geiger hopes to share his thoughts in environmental issues with the campus. 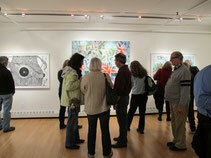 “Perhaps some of the topics within the paintings are of shared interest to students and faculty. I am not a scientist, nor a specialist in any of these topics. I am just an artist using a traditional visual medium to hopefully create poignant signposts that reflect our time period, and perhaps bring a little magic along with it,” he concluded.